UK based company, Aquaforno, will be unveiling the latest generation model of its flagship all-in-one portable cooking stove, Aquaforno II, for the first time at the Caravan, Camping and Motorhome Show (CCM Show) at the NEC, Birmingham, on February 20, stand 5178. 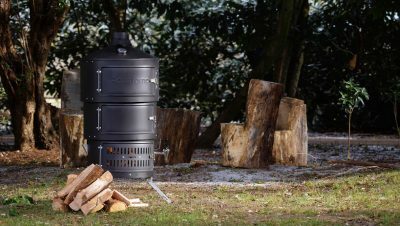 The eagerly awaited developments to the award-winning outdoor cooking system, which is telescopic and assembles in under 3 minutes, have been designed with the company’s core markets in mind; scout groups, families, campers and glampers, adventurers, general barbecue fans and gadget lovers. In addition to these new outdoor gastronomical possibilities, the latest design includes a double insulated lid for enhanced temperature stability. Its adjustable vent and new thermometer allows for temperature control, and a clever spark arrestor has been built in for extra safety. It also has spring-loaded legs for easier assembly and a more user-friendly, sturdier, door mechanism. “Not only is it portable and easy to assemble, it cooks anything from a Sunday roast to a full English breakfast, to a paella, with consummate ease. It is the ultimate glamping product,” adds Rhodes. “It can even cater quickly and efficiently for large groups, for example, cooking as many as twenty delicious restaurant quality pizzas per hour. You can sit around the Aquaforno to keep warm, dry wet clothes on it using its handy clip-on hooks and enjoy hot drinks or wash-up via the removable, dishwasher-friendly kettle that provides a litre of boiling water every six minutes. “Aquaforno is designed to bring people together outdoors,” continues Rhodes. “Whether you’re at a camping site, on the beach, on a fishing expedition or in the backyard, the Aquaforno can go where you go and cater for all your outdoor needs”. In March, the company will launch a crowdfunding campaign on Indiegogo where customers can place pre-orders for Aquaforno II to support product manufacturing. The company is encouraging existing and new Aquaforno fans to spread the word about the crowdfunding opportunity online. The previous Aquaforno cooking unit recently won Camping Product of the Year in the UK Outdoor Industry Awards 2017 and was acknowledged as a top camping product at The Gadget Show Live and was featured on The Hairy Bikers’ BBC Northern Exposure series. To learn more about the new Aquaforno II and how you can pre-order and get involved in crowdfunding for this product, please visit http://aquaforno.com/express-your-interest. Caption: Aquaforno launches next generation outdoor cooking stove at CCM Show 2018. The Aquaforno concept was born when its founders, Tim Rhodes and Karen Jenkins were tasked with entertaining a large crowd for their daughter’s 13th birthday ‘camping-party’ and incorporating Poppy’s favourite food, pizza, into the mix. Tim rustled up a rudimentary pizza oven and the duo soon realized the potential it could bring to the outdoor cooking world. Aquaforno was established in 2011 and has since delivered its award-winning, patented range of outdoor cooking companions to a diverse worldwide customer base; from scout groups, campers and glampers, to adventurers, general BBQ fans and gadget lovers, who all share a passion for the outdoors and good food. Today, Aquaforno provides its users with an all-in-one BBQ grill, rotisserie, smoker, pizza oven, hot water boiler, along with a way to keep warm and a place to dry their wet socks. No other portable cooking system on the market offers as much functionality and versatility as Aquaforno. For more information, visit www.aquaforno.com.